Soccer – The grace of ballet, the fire of a mountain folk dance, the rhythm of boogie, all rolled into one and hidden beneath knee-socks and cleated shoes. Welcome to the US Youth Soccer Player Development Model. The purpose of this publication is to help youth soccer coaches and soccer clubs raise the level of play across the country. This can be achieved by becoming aware of the capabilities and aspirations of their players at each stage of their development and by creating more positive, player-centered learning environments. The key to modern youth player development can be found in the lessons of the free play era, where children took charge of games, learning and fun. By participating in endless hours of player-centered soccer, the children of the street soccer generation developed a life-long passion and a practical feel for the game that has been all but lost in the transfer to over-organized sport. By returning to the ideals of the free play era, youth coaches and soccer clubs can use meaningful soccer games and soccer-related activities to unlock the potential of their young charges to produce savvy, sophisticated American players. What is soccer? The beauty of the game is in its simplicity. Within a given set of rules there are two teams who compete to score goals against each other. Each team consists of 11 (or fewer) individuals who must use their abilities to play together while trying to win the game. It’s hard to play simple. Simplicity is GENIUS! This Primer provides information on the basic principles of play, Small-Sided Games (SSG) and the stair step approach they provide to development, systems of play, soccer as a long-term development sport, fair play and how to organize player-centered training. It also touches on the importance of continuing education for staff, age appropriate training methods, the development of a coaching philosophy, seasonal planning, the value of good soccer facilities, the importance of a progressive, developmentally-based club-wide curriculum and above all else, the art and science of coaching. Coaching development is a life-long process that is fundamentally tied to player development. Simply, the better the coaching, the faster players will improve. To become a good coach requires study. Coaches must understand players, teaching methods, learning styles, psychology and even parental involvement in youth sport. This Player Development Model offers information and advice, but not magic formulas for player or coach development. Ultimately, each coach is responsible for their own skills and insights and for the environment created. The coach is on the front line of development in a youth player’s career, and the coach’s continuing education is vitally important to that development. There are over 5,000 US Youth Soccer clubs across the nation. Each club has the obligation to provide its members the opportunity to play the game while learning and growing as individuals. The opportunity to participate follows the major player development pathways of both recreational and select soccer. The US Youth Soccer recreational pathway includes the US Youth Soccer American Cup, Soccer Across America and TOPSoccer (The Outreach Program for Soccer). The select pathway includes the US Youth Soccer National Presidents Cup, US Youth Soccer Regional and National Leagues, the US Youth Soccer National Championship Series and the US Youth Soccer Olympic Development Program (US Youth Soccer ODP). U.S. Soccer uses this Player Development Pyramid, giving broad direction to soccer environments while impacting the development of youth players. Zone 1 has a technical emphasis that is accomplished by focusing on player development versus match outcome. The intent is for coaches, administrators and parents of the players to spotlight the process of playing the game, rather than the score. 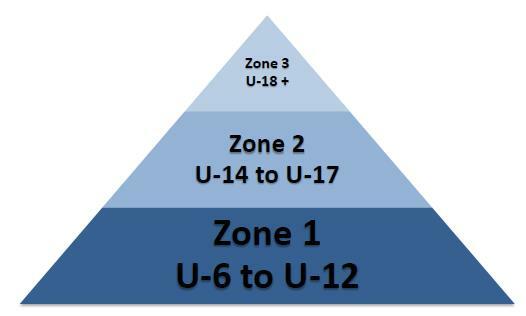 The measurement of success in Zone 1 is the players’ improvement of ball skills, understanding of the rules of the game, playing fairly and learning general game principles. In Zone 2 the emphasis is on the club culture and daily training atmosphere. There must be more training sessions and fewer matches so the players can learn the details of tactics, team formations and game strategies. The focus in Zone 2 needs to be on training sessions. Zone 3 takes the player toward professional player development. This development will occur in college, semi-pro and professional and youth national teams. This is the age to focus on the outcome of the match as well as the quality of performance. A curriculum is a plan for teaching the subject. It is an attempt to account for all the learning guided by the coach. The process of learning is made easier if both the coach and the player know what the coach is trying to achieve. This should be an explicit statement, the more specific and precise the better. These statements are the coaching objectives within the curriculum. The player is aided knowing not only what to do, but also whether he or she has done it. The coach’s task is easier when knowing what to look for in the player’s performance. There should be continuity throughout the year in the way training sessions are conducted. Plan all training sessions in advance and in detail. The radial below [Soccer Skills (Worthington, 1974)] gives an overview of the factors influencing player development within all four components of soccer (below), described here as soccer skill. Like any teacher, a soccer coach must decide what skills will be introduced during the year and in what sequence. This necessity requires seasonal planning on the coach’s part and will be covered later. 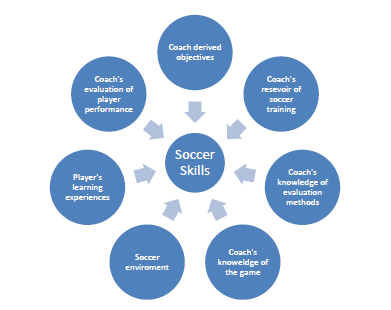 Soccer Skills: Coach and player impact upon skill development. Collectively, these factors influence the soccer culture of the club. While the curriculum is the baseline for what to do in training, coaches should observe matches to understand developmental needs of each player. The coach must be flexible with the curriculum and be ready to adjust it based on specific needs. Evaluating the players in a game may show an immediate need of a player or of the team that may call for a deviation from the current point in the curriculum. How players perform may dictate progressing ahead or lapsing behind the schedule of the curriculum. There is a difference between a training session and practice. Practice is time with the ball that a player spends alone or with a friend or two. Players should be encouraged to practice on their own, knowing that self-motivation provides the best results from practice. A training session is with the team and the coach and should replicate the game. It is necessary to be realistic with the activities in a session plan according to the age group being instructed. 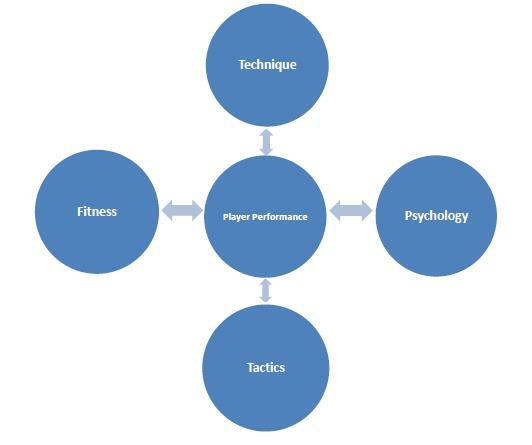 The curriculum should consist of the four components of soccer (below) used to develop player performance. To tie the four components together for both the player and the team as a whole, the principles of play must be evaluated. In each age group, the four components of soccer will be discussed, incorporating the applicable principles of play to the age group. The principles of play are essentially the checklist a player goes through mentally for each tactical situation that occurs in a match. Over many years of appropriate training and matches, these principles will become second nature for the players, and improved decision making quickens. The foundation to building a team is to inculcate, within the players, the principles of play through those four components of soccer. Principles of play for each of the six roles on the team. Transition is the most important moment in soccer — the moment in the match when individual players switch their player role in the game from defense to attack or attack to defense. Transition is understood first by an individual player, followed by a group of players. Then the team learns to see the same tactical cues. That ability leads them to reading the game. This moment of transition occurs first as mental recognition of the situation and then as a decision that initiates physical action. The faster the recognition-decision-action connection is made, the more impact a player’s performance will have. Only once individual players are quickly making the transition from one phase of play to the next will it be possible for a team to execute quick and skillful transition from defense to attack or vice versa. If transition does not happen fast enough for a player or team, they will always be a step or two behind the action. The speed of a player’s transition is based on his or her tactical awareness. Tactical awareness is being mindful of where one is on the field, as well as the location of the ball, teammates and opponents. It is the ability to read the game, to anticipate what will happen next and not merely react to what just happened. In some soccer circles, this tactical awareness is called insight. In American soccer, this level of mental focus and tactical awareness is referenced as being soccer savvy. Players have no chance of becoming soccer savvy players if they are simply cogs in the team wheel. Transition in training session activities must become an ever increasing aspect as they mature. Players who are over-coached in matches become robotic in their performance and cannot make tactical decisions fast enough. Slow decision making leads to reaction players instead of anticipation players. The over-coaching comes not only from coaches, but spectators who constantly yell out to the players what to do and when to do it. This environment of coaches and parents making soccer decisions for the players during a match has led to a weakness in transition. The goal is to develop anticipation players – players who can read the game and are mentally one step ahead in the game. This sort of player evolves in a healthy soccer environment. That environment requires less coaching during matches and better coaching during training sessions. The training environment should lead to self-reliant players who think and communicate for themselves during a match. The foundation to a good soccer environment in a club is a well-planned and consistently executed player development curriculum. From this foundation, a positive soccer culture can be built. Too often coaches concentrate on a team formation to the exclusion of essential developmental needs. A common question is, “What is the best formation to win?” Some coaches are quick to permanently place a player in a specific position. That is an erroneous decision. In fact, many coaches teach the game by position. This approach has an over emphasis on a particular system of play and the team formation to execute that system. Systems are not the focus, but rather the framework. The decisive factor is the player and his or her individual qualities, specifically technical expertise. Players must be given the chance to play every position in soccer to deepen their understanding of the game. While it takes more coaching talent to do so, teaching positioning prior to the roles of positions in a formation develops anticipation players. Do not lock players in a position! Top teams play offensively, fast and flexible. To achieve the form of top teams, players must be soccer savvy and versatile. These are players who can adapt to several different systems of play and can take on diverse roles in various team formations. Remember that the formation is merely a platform, a reference point, for the players from which to play soccer. Soccer, like all team sports, involves both elementary and sophisticated tactics. The general principles of play and the division of the field into the following three specific areas (see Thirds and Channels image below) help clarify tactics for the beginning player and coach. 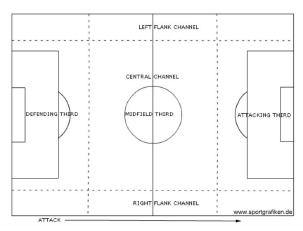 The three divisions of the field cover the defending, midfield and attacking thirds. The midfield third is the same for both teams, while the defending third for one team is the attacking third for the other. The basic strategies performed in each third help make for an attractive and well-played game. Furthermore, the field is divided into three channels running the length of the field – two flank channels and one central channel. Good games can be planned. Great games just happen. The three main phases of seasonal planning are preseason, season and postseason. The youth soccer coach must also take into account other activities in which the player is engaged. These include school and extracurricular activities, other sports, US Youth Soccer ODP, family and social functions, religious events, etc. These activities will influence the player’s soccer experience. The game is the best teacher – maybe. It does indeed teach players by showing them their strengths and weaknesses. However, too many matches in the player’s schedule become a hindrance to development. There must be a proper balance between the number of matches played, training sessions per season and time off each season. Coaches need to have a schedule for the season. A seasonal plan should begin by devising the schedule from the last possible event the team could attend in that soccer season. For the U7/U8 team most likely this is an end of the year soccer jamboree or festival or perhaps just the last play day on the schedule. For the U18 team, the last event could be the finals of the US Youth Soccer National Championships. Whatever the last event is, plan from that point back to the beginning of the season. This will allow the coach to see the scope of the steps needed to develop players whose skills will culminate at the final season event. Take into account match days, training days, regeneration training days, specialty training, holidays, major school events, planned days off and tournaments. Planned time off is vitally important to avoid over-scheduling, overuse injuries and mental burnout. Both the players and the coaches need time off to recharge their batteries and come back to soccer reinvigorated. It is possible to have too much of a good thing. Club and high school coaches need to work together for the sake of the players on dovetailing their seasons. A week or two off between seasons for the year-round players will reduce burnout. After a little rest and relaxation, the player will come back fully charged and ready to give 100 percent. If this formula is not followed, then players giving a fraction of their ability will become the norm. Clubs and coaches must plan a reasonable soccer year calendar for each age group. Certainly the U5 schedule should not have the same intensity, duration and frequency of activity as the U16 schedule. Beware of the too much too soon syndrome. A symptom of the syndrome is the more is better mentality. For positive player development that will last for decades, a balanced approach must be taken. 1) Develop the child’s appreciation of the game. 2) Keep winning and losing in proper perspective. 3) Be sensitive to each player’s development needs. 4) Educate the players to the technical, tactical, physical and psychological (four components of soccer) demands of the game for their level of play. 5) Implement rules and equipment modifications according to the players’ age group. 6) Allow players to experience all positions. 7) Players need to have fun and receive positive feedback. 8) Training should be conducted in the spirit of enjoyment and learning. 9) Provide the appropriate number of training sessions and matches according to the player’s stage of development. 10) Strive to help each player reach their full potential and be prepared to move to the next stage of development. As a team sport, soccer is a late specialization sport. A multi-sport experience provides a solid base to long-term development as a soccer player. From 6 to 12 years of age, children should have opportunities to be in different sports. Concentrating on one sport is inappropriate in terms of physical and game-sense development. The goals of any coach working with a young player who is pre-pubescent should include increasing proficiency of physical ability, developing functional versatility from a strength, movement and biomechanical standpoint and lastly, diminishing the potentially negative effects of specialized training. Subsequently when working with pre-pubescent aged players, the mandate should be one of global, all-encompassing development rather than specialization in one sport. With pre-pubescent children, muscle innervations are completed roughly by the age of 6, although individual variances occur. Muscle innervations refer to the final expansion of nerve endings within a muscle fiber’s interior. At the conclusion of the muscle innervation process, children are able to learn and begin the process of establishing functional ability in gross motor skills and movement patterns. At approximately age 6, it is realistic to begin teaching ball skills. Innervations are linked to coordination and motor control, so it stands to reason that children gain proficiency in gross motor skills more quickly than finer skills. This is another argument as to why early specialization is counterproductive – every sport requires various degrees of fine motor skills, which simply cannot become functional abilities in younger players. Within a child’s brain, specifically the cortex, stimulation and excitability govern over inhibition. This means young children are prone to poor concentration, especially over prolonged periods, and display indiscriminate reactions when responding to a specific situations, particularly those involving sudden changes of direction. Reflexes become conditioned and more permanent around 10-12 years of age. Reflexes are extremely difficult to develop during puberty. This supports the fact that variety and well-rounded skill acquisition is crucial to training a young player. The inability to develop appropriate and specific reflexes in the teenage years supports the need to introduce young players to as many athletic experiences as possible in the early years. One of the interesting features in support of varied development is the concept of plasticity. Plasticity refers to the ability of the young brain to adapt to new stimuli. The plasticity of the brain and nervous system declines rapidly in time, and actually may reach a functional limit, athletically speaking, by the late teenage years. Brain development is a long process and based largely on exposure. In fact, the brain development period, which extends through childhood and into adolescence, is characterized by an increased ability to adapt to new stimuli or high plasticity. However, this process does not continue equally forever. There are critical periods for different types of learning. If a skill is not acquired during its critical period, then the acquisition of that skill later in life will be harder, if not impossible (Erikson, 1950). Conventional wisdom often supports an as soon as possible perspective, which many youth sport experts see as flawed. Evidence (Grasso, 2004) suggests that the earlier children begin playing organized youth sports, the sooner they drop out. This is especially true if the youth soccer program does not focus on psychomotor, cognitive and psychosocial development domains. Please note that there is a plus or minus three-year range from the player’s chronological age in his or her development in each of these domains. This domain is the physical fitness development of players from childhood through late adolescence. Emerging athleticism in players will happen at individual rates. Some will blossom early and some late. In the best interest of the players a well-rounded approach to fitness improvement includes the ball most of the time. It has been said that soccer is a thinking game. But few youth coaches today intentionally provide training environments for players that cause them to problem solve. Yet when it comes to game day, the players must make all of the game decisions, many of them in the blink of an eye, given the pace of the game. Teach players not just to play hard but to play smart. Encourage them to think for themselves on the field. Jean Piaget (1896-1980), Swiss Psychologist and Developmental Theorist. Piaget’s theories center on his discovery that children perceive the world differently than adults and that their development proceeds in determined stages which always follow the same sequence. He viewed imitation as an important part of learning via the play process. The general consensus among youth sports experts is that some children reach the social and cognitive maturity required for successful participation in organized sports at the age of 8. The ability to understand the complexities of game strategies however is usually developed in children who are 12 or older. Thus, most children are not ready for competitive sports before they complete the first or second year of middle school (Coackley, 1994). Play has long been understood to provide children with the experiences they need in order to learn social skills and values. Through play, children become sensitive to other children’s needs and values, learn to handle exclusion and dominance, manage their emotions and learn self-control, as well as share power, space and ideas with others. At all levels of development, play provides opportunities for children to feel comfortable and in control of their feelings by allowing the expression of emotions in acceptable ways. Soccer provides children with the opportunity to negotiate and resolve conflict (Erikson, 1977; McArdle, 2001; Piaget, 1959; Winnicott, 1968). Thus the concept behind the psychosocial aspect of soccer is assisting children and adolescents to address a myriad of social and psychological challenges simultaneously in gentle and non-intrusive ways through their natural predilection to play (Bell & Suggs, 1998; Henley, 2007). The development of a soccer player is a long process in which the players progress gradually from a simple to a more complex involvement in the game. This progression requires proper guidance and direction from coaches who are ethical, knowledgeable and licensed. This process cannot be rushed, but players should participate at a level that is both challenging and demanding. There is no guarantee that a player will reach his or her potential, but the opportunity must be provided! The coach turns technical, tactical, psychological and physiological (four components of soccer) know-how into reality. The ultimate goal is to prepare the players to participate at the next level. The next level could be the next age group or a different level of competition. Both of these levels are encompassed in the Stages for the Ages progression illustrated below. Many of the adults organizing youth soccer do not fully grasp the timeline for the development of a soccer player. Since the majority of soccer players in most communities are children and teenagers they think that soccer is a child’s game when in fact it is an adult game. Because of this basic misunderstanding they think soccer players are supposed to peak somewhere in the range of 13 to 16 years old. In fact soccer players peak in their mid-to-late twenties for field players and perhaps the early thirties for goalkeepers. Indeed, biologically, adolescence ranges from 15 to 23 years of age. Soccer players do not peak athletically until they are in their twenties, as well as fully developing their tactical awareness and emotional control. Once adults comprehend this realistic age for a fully developed player, they understand the sound logic behind a proper player development scheme. It begins to make sense that too much too soon will in fact harm the players more than help. Adults then become aware that the appropriate approach for development is not an out-come based approach but a process-based approach. Since a youth soccer club could potentially have a player from age 4 to 19, then it is clear that a patient approach to proper development is realistic. Ultimately success is in seeing lifelong players give back to the game! The focus of soccer programs at a young age should be on unhurried and diverse play in an environment that promotes positive developmental settings. The coach’s responsibility here is to provide soccer activities that challenge youth players to advance to the next level of learning while keeping them motivated in an environment that promotes important citizenship qualities. 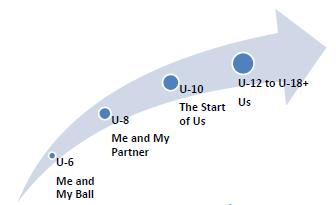 The club curriculum should follow the three biological stages of pre-adult growth: childhood, puberty and adolescence [Table 9]. The coach needs to be knowledgeable of the broad characteristics noted for the ages in each stage. In this way, the coaches and the administrators can prepare a positive, player-centered environment that will enhance the growth of the players. The coach’s role during the sampling years includes an approach centered on children’s needs instead of performance outcomes. The coach should act as a resource person who can restructure the play and practice environment (avoid imposing a rigid structure). The coach should also focus on self-motivating behaviors versus externally controlled activities, encourage and support multi-sport involvement, avoid year-round training in soccer and advocate the use of game sense teaching. In the specializing years, adolescents should choose the sport they prefer. Coaches should create an environment that is enjoyable and challenging, address the different goals and needs of individuals with different skills and objectives, and finally, provide a deliberate balance of both training and play. During the same period, some players will choose recreation play over select play and the coach has goals here, too. They are to address the different goals and needs of individuals, focus on self-motivating behaviors and support and encourage recreational participation in soccer. It is during puberty that players generally make the choice to specialize in soccer or to participate in recreational soccer. Either decision is fine since the goal of coaches is to keep youngsters in the game. They must be given free choice of the path they wish to follow. During the investment years the coach’s deliberate practice becomes the focus of players’ training and will provide physical and social resources to overcome the effort and motivational constraints associated with deliberate training. Jean Jacques Rousseau (1712-1778) believed that experience (doing) was necessary for perceptual change to occur. This included play experiences. He believed that curiosity and play should be used to inspire learning. Remember that fulfilling player potential takes time. The coach must train players to understand and master the progressively difficult game of soccer. The success in the growth of players is not only measured in the victories gained but the number of players moving up to a higher level of play. The game within the child progresses through continuous development of creativity and mastery of the ball. That pathway for development demands the players be allowed to learn by trial and error, experiment with new skills, experience a variety of game demands, demand high standards from themselves, make their own decisions during a match and play with exuberance. The American player should have a ‘feel’ for the game, be comfortable on the ball, athletic and enjoy the game. Mostly random technical repetitions, psychologically friendly and positive, simple combinations and decision-making activities. Individual basic skills with an emphasis on keeping ball possession. A lot of balance and coordination exercises. Free play – movement education – trial and error – discovery – experimentation! More combinations on attack and defense. Many decision-making environments. Psychologically positive with correction. Advanced competitive skills against match opponents. Tactically work on the roles of attack and defense and the basic principles of play. Exercises should focus on endurance, rhythmic movement, flexibility and running mechanics. Application of where it all fits into the game. Matches of 3v3 to 6v6. Festival Style (non-results oriented) tournament events. Many fun and competitive games. Gain technical skills and game insight by playing in simplified soccer situations. Matches of 8v8 to 11v11. Less emphasis on the match results and more emphasis on players’ performances. 11v11 matches with a strong emphasis on combination play. Matches should be used as a learning opportunity to execute new tactical concepts and team formations. Must be a balance between competitive matches and training games. Children of the same age may differ a good deal in motor skill development. A child’s motor skills develop in a particular sequence: first they learn to crawl, then walk, and then run, jump and hop, in that order. There is a developmental sequence in learning a single technique, too. As players practice a particular technique, such as dribbling, they use their bodies more effectively each time and reach a higher level of development in that technique. Children progress through motor development sequences at their own rate. Players of the same age may be at different development levels because of differences in motor ability and in the amount of time they have practiced the technique. The important thing is that each player shows continued progress. Children of the same age will differ in physiological development (bone growth and muscular strength). Those who for their age excel in soccer are often more advanced physiologically than others their own age. Children, although loaded with energy, must be given rest periods. Compared to other periods in a child’s life, these ages are the slow years in physical growth, making it the best time to learn new techniques. Children have not learned to accept mistakes – their own or others. Children lack the ability to make quick decisions. Children are in need of understanding and encouragement. Children like to play with others but side-by-side rather than together – “Me first…” rather than “Let’s both do this…” It’s a difficult time to teach tactics. Indeed the focus should be on teaching ball skills within game-like activities. Children have not yet learned the skills of compromise and team play. Expect frequent argument. Do not interfere with their arguments, as it is a part of their learning process. Children should not be expected to play a team game the way adults would. The rules should be bent to fit their physical and mental maturity. Fewer players result in more touches of the ball. Equipment suitable to their age and size results in better play. Team games call for social and mental skills that they are just starting to develop. Adult reactions to their efforts are often mistaken and become a blow to their self-confidence. Provide equal opportunity and playing time for all participants. All children are individuals and should be treated as such. Our society fosters cooperation and competition. Soccer activities can promote these behaviors. Provide the opportunity for each child to participate in challenging, meaningful and varied activities planned to enhance each one’s perceptual motor development and total psychomotor development to his or her fullest capability. Children should be able to choose their own activities as much as possible for responsible decision making. Developmental goals will be met by any of the activities the children may choose. The coach and the parents must structure the child’s environment to enhance the development of fitness. The home environment plays an important role in the learning process (cultural patterns). Promote cooperation and fair play; enhance self-worth. Discuss the difference between winning and success, losing and failure (one does not necessarily equate to the other). Conduct training sessions and plan activities that are fun and challenging but also emphasize the importance of skill acquisition within that framework. Apply reinforcement and corrective feedback as necessary. Facilitate a positive learning environment both at training sessions and matches. Demonstrate technical and tactical skills and how they can be adapted to further the enjoyment of other sports. Encourage participation in general recreation activities and complementary sports. Establish and refine training that increases the players’ understanding of the correct use of space, width, depth, mobility and other principles of team play. Each player should be given the opportunity to develop to his/her fullest potential (physically, mentally, socially, emotionally and intellectually) while working at his/her own rate and present challenges at every level of ability. The player development scheme should include a program of psychomotor development that is varied enough to meet the needs and interests of the individual, which introduces skills that allow for carry-over activities in later life. The player development scheme should incorporate a variety of teaching and learning styles to allow for maximum participation of each individual. The player development scheme should be sensitive to the ethnic flavor and socio-economic status of the player population that allows players as members of a free society to express themselves openly in an enriched environment. Subject to the agreement of the member association concerned and provided the principles of these Laws are maintained, the Laws may be modified in their application for matches for players of under 16 years of age. All ages can play small-sided games, but it has a greater developmental impact on younger soccer players. This has to do with the stages of development that all children go through. As children progress through these stages they mature physically, emotionally and mentally. The reasoning behind small-sided games for children is to provide them a stair step approach to learning and playing the adult game of soccer. The small-sided game environment allows them to gradually learn the rules of play, game strategies, tactical concepts, teamwork and fair play as well as quality ball skills through increased time with the ball. American players need to spend more time with the ball. From ages 4 to 14, ball skills must take precedence over the score and the win/loss record. Without ball skills, soccer that is dynamic, intelligent, tactical and exciting will not be possible. Refinement of ability to an expert level takes 10,000 hours of correct repetition according to research supported by the United States Olympic Committee. See the table below for additional guidelines regarding the relationship between age and number of ball touches. Plato (427-347 B.C.) From 3-6 years of age children should be absorbed with play, in games of their own devising. Why no keeper until U-10? The analysis of most soccer experts is that small-sided games for young children are most beneficial for learning basic motor skills, basic rules and the fundamental concepts of the game. They also learn how to interact with their peers within a game involving a ball. What is not supported is the use of goalkeepers in this format. Children want to run, kick the ball and score goals. Every child should experience the triumph and success of scoring a goal. They don’t do well when told to stand in one place. If the action is at the other end of the field, a young goalkeeper will find some other activity to hold his or her attention. Young children have great difficulty visually tracking moving objects, especially if they are in the air. Most children younger than 10 are very reactionary in their movement behavior and will duck or throw hands in front of the face if the ball comes toward the head. Anticipating where the ball might be played is a skill that has not yet developed and that does not really develop until age 9 or 10. Prior to age 9, visual tracking acuity is not fully developed. Players have difficulty accurately tracking long kicks or the ball above the ground. Beginning at approximately age 10, one’s visual tracking acuity achieves an adult pattern. Striking the ball at a small target accurately is a challenge for all children. Goalkeepers restrict the opportunities to score goals to a select few players. Young children stuck in goal will not develop goalkeeping skills and are more likely to get hit with the ball than actually save it. It is important to wait until children are better able–physically, mentally and emotionally–to handle the demands of being a goalkeeper. There are no goalkeepers in the 3v3 and 4v4 format through age 8; goalkeeping is then introduced in the 6v6 format beginning at age 9. This still allows plenty of time for children to grow up and be the best goalkeepers they can be; most likely keeping them engaged in playing soccer for many years to come. Once players take on the goalkeeper role, they tend to grow in the position through three general stages. Those stages are shot blocker, shot stopper and finally goalkeeper. The shot blocker stage is one where the goalkeeper simply reacts to shots after they have been taken. He or she tries to get into position to make saves and this is sometimes merely blocking a shot and not making a clean catch. The attacking role of the shot blocker is usually just a punt of the ball downfield. At the shot stopper stage, a player has progressed to not only making saves after a shot is taken but also being able to anticipate shots. With this improved ability to read the game, the shot stopper gets into better positions to make saves and begins to stop shots from being taken in the first place. The shot stopper now comes out on through balls and collects them before a shot is taken. The shot stopper also cuts out crosses before opponents can get to the ball. The shot stopper comes out in one-on-one situations and takes the ball off the attacker’s feet. The shot stopper can deal with the ball both before and after a shot is made. Distribution with some tactical thought on the attack is also developing for the shot stopper. The goalkeeper stage is the complete package. The goalkeeper is highly athletic and physically fit. The goalkeeper is mentally tough, composed and confident. The goalkeeper has the full set of skills for the role to both win the ball (defending techniques) and to distribute the ball (attacking techniques). A full-fledged goalkeeper is indeed the last line of defense and the first line of attack. A goalkeeper not only makes saves but contributes to the attack with tactical and skillful distribution of the ball. The goalkeeper is physically and verbally connected to the rest of the team no matter where the ball is on the field. A first-rate goalkeeper is mentally involved in the entire match and is therefore physically ready when the time comes to perform. From U9/U10 to U18+ teach players to follow these rules when they are in goal. You may not be able to stop every shot that comes your way, but if you make the attempt, you will find that you are stopping shots you never before thought possible. You will also have the personal satisfaction that at least you made the attempt and your teammates will be more forgiving even if you miss. 2. After a save – get up quickly! If you have gone to the ground to make a save, get back on your feet as fast as possible. Look for a fast break distribution or direct your teammates into position to receive a build-up distribution. This aspect is particularly important if you are hurting. You cannot show weakness, start the counterattack. This will particularly intimidate your opponents and raise the confidence in your teammates. 3. Do not be half-hearted – 100 percent effort! Every time you make a play, it must be with all of your ability. If you go halfway, you will miss saves and possibly injure yourself. You must constantly give brief instructions when on defense. When your team is on the attack, come to the top of your penalty area or beyond and talk to your teammates and offer support to the defenders. Be mentally involved in the entire match, no matter where the ball is. 5. No excuses! No whining! Just get on with the match. If a goal is scored against you, a corner kick is given up or the shot is a near miss, do not yell at your teammates even if it’s their fault. Do not hang your head or kick the ground or the post if it was your fault. During the match is no time to point fingers or make excuses. The play is over, it’s ancient history; get on with playing the remainder of the match. Focus on what lies ahead! The small-sided game environment is developmentally appropriate for our young soccer players. It’s a fun environment that focuses on the player (Goodman, 2004). And it is about the player; isn’t it? The goals of youth soccer should be to promote physical activity, fun, life skills (i.e., self-reliance, conflict management and purposeful interaction with others), fair play and good health. Many soccer programs start out like this, but change over time because adults and children misunderstand the difference between competition and cooperation. Youngsters used to play with friends after school and on weekends. For a variety of reasons, they now are enrolled in organized, competitive soccer programs. Is this fact a concern? Can a child be too young for soccer competition? This seemingly easy question is actually quite complex to answer. The coach must first think of organized competitions where the players compete against each other in matches according to specific rules. This is a so-called adult model of competition. Now a child’s readiness for competition must be assessed, accounting for biology, sociology, psychology and physiology. A young player may be physiologically ready for the demands of competition but not psychologically ready. At age 5, children start to compare themselves to other children. Even so they still don’t understand competition. They tend to play when they are having fun or winning, but lose interest when the opposite occurs. Even at 8 years old, children may not be physically or emotionally ready or have the cognitive skills to understand and meet the expectations that parents and coaches have of them. They may not have the social skills to understand turn-taking or be emotionally ready to handle criticism. The benefits soccer offers can be lost if results-oriented competition is emphasized too soon. Overt competition involves more ego-oriented goals and tends to promote the attitude that winning is everything. It often discourages children from trying new tasks, but can encourage them to break the rules in order to win. Cooperation in soccer is the willingness to work together to achieve a common purpose, which empowers players with creative problem solving skills, better communication skills, more sharing of emotions and a better sense of team. Parents, administrators and coaches have a large influence on the process of balancing cooperation and competition. The needs and goals of the players must be considered in order to build a successful youth soccer program. Now as to the original question, “Can a child be too young for competition?” Yes, when referring strictly to the adult model of competition. Youngsters do not have the psychological, social and physical skills necessary for the results oriented environment. However, if the adult leaders structure competition to make it developmentally appropriate for these young players, they can benefit from the experience and develop the skills to prepare themselves for competition. The importance of giving the game back to the players cannot be overemphasized. Whether it is called street soccer, a sandlot game, a kick-about or a pickup game, this is the way millions upon millions, for over 100 years, have learned to play soccer. While the pickup game has not disappeared in the U.S.A., it is not used in youth soccer as it could be. There are millions of youngsters playing soccer in this country, so why are pickup games not seen in every park? There can be many reasons why so few pickup games happen in youth soccer. They include a sedentary lifestyle, vacant lots for playing no longer exist, and the design of neighborhoods now-a-days creates little or no yard on which to play, parents are reluctant to let their children play away from home without adult supervision, soccer facilities are closed except for scheduled events or young people simply don’t know how to organize a game. There can be more reasons and some of the ones noted are beyond the direct control of most soccer coaches. The one that is the most disturbing is that children do not know how to organize their own games. How has it come to pass that children cannot throw down objects to mark goals, pick teams and play? Part of the answer is that coaches have taken the game away from the youngsters. There is over coaching and over organization. Coaches, parents and administrators need to give the game back to the players. In the 1970s and 1980s, coaches had to be a focal point of most soccer experiences since so many of the children were just then being introduced to the game. Unlike today, there were very few televised soccer matches and in many communities none at all. Professional and college teams were not nearly as prevalent as today, so the opportunity for a child to go watch adults play the game was rare. Even to watch a World Cup match one had to go to a theater for closed-circuit TV. Consequently, the coach had to demonstrate all of the ball skills, show players how to position themselves on the field and teach the rules. While that is still true to an extent today, there are many models for a child to see how to play the game. The coach no longer needs to be at the center of a new player’s soccer experience. Now keep in mind that coaches are not alone in the need to give the game back to the players. The need for organization has been a double-edged sword for American soccer. The ability to organize has created teams, clubs and leagues and quality soccer complexes that dot the land. This organization has provided quality coaching and referee education, and the game has grown tremendously for the most part by the labor of volunteers. But organization has a downside, too. Adults meddle too much in the children’s soccer world. Everything is planned out! The children do not know how to organize a pickup game because they are seldom allowed the opportunity. Good organization is an American trait, but what might be driving the compulsion to infiltrate adult organization into child’s play? As a sports nation, we suffer from the too much too soon syndrome. Many adults involved in youth soccer want so badly to achieve success, superficially measured by the win/loss record and the number of trophies collected, that they treat children as miniature adults. Unfortunately, it is the adults who lack the patience to let the game grow within the child naturally. In the National Youth License coaching course, the idea of street soccer is presented. This is a way for the club to begin giving the game back to its rightful owners, the players. The club provides the fields and supervision for safety, but no coaching, allowing players to show up and play pickup games. Granted, it’s not as spontaneous as a neighborhood game, but it does provide a chance to play without referees, coaches and spectators. This means the children are free to learn how to organize themselves, solve disputes, become leaders, rule their own game, experiment with new skills, make new friends and play without the burden of results. If the club wants to provide an even more productive fun-filled environment, then it can put out different types of balls to use in some of the games, encourage them to set up fields of different sizes, allow mixed age groups to play together and even have coed games. The players have a lot they can learn from each other. After all, players learning from players has produced Michele Akers, Landon Donovan, Mia Hamm, Kasey Keller and many other world class players. That same unencumbered environment has produced the multitudes that support the game. When adults give the game back to the players, in some small measure, they are likely to keep more players in the game for a lifetime, and then the odds improve for the U.S. to produce its share of world class players. Youth soccer now lives in the culture created over the last 30 years. Will we evolve? Lack of psychological distress for game results except from the players themselves. Opportunity to play with and against a variety of players, each of whom present different strengths and weaknesses which help individual and group improvement. Opportunity to take chances with new skills and ideas. Opportunity to play with variations of the number of players and size of the field which enhances tactical growth. The ‘street soccer’ environment requires players to think for themselves which allows the chance for anticipation players to evolve. One of the beauties of soccer is that the game can be played anywhere the ball can roll, and playing in a variety of conditions helps to develop more well-rounded players. A mix of outdoor and indoor soccer along with some variety in the type of playing surface, size of field and type of ball used will have a positive impact on ball skills and clever play. One possibility is soccer on the beach, which is not only great fun, but certainly impacts the players’ skills and physical fitness. Players are more likely to experiment with more acrobatic skills on the beach, too. Allows players to frequently touch the one toy on the field, namely, the ball. In a statistical study comparing Futsal to indoor soccer with walls, players touch the ball 210 percent more often. Presents many opportunities to score goals. With limited space, an out of bounds and constant opponent pressure, improved ball skills are required. Maximizes active participation and minimizes inactivity and boredom. Action is continuous so players are forced to keep on playing instead of stopping and watching. Provides a well-organized playing environment with improvised fields. Without a wall as a crutch, players must make supporting runs when their teammates have the ball. Reflects the appropriate role of the coach as a facilitator. With all the basic options of the outdoor game in non-stop action mode, players’ understanding of the game is enhanced. Players enjoy the challenge of playing a fast-paced, fun and skill-oriented game that tests their abilities; allowing the game to be the teacher! The traditional way sports have been taught is with the coach as the center of attention. The coach tells the players what to do, command style, and then expects them to produce. With the command style, the coach explains a skill, demonstrates the skill and allows the players to practice the skill. In contrast to reproduction of knowledge in the coach-centered approach, the guided discovery approach emphasizes the production of new talents. The approach invites the player to think, go beyond the given information and then discover the correct skills. The essence of this style is a coach-player connection in which the sequence of information and questions leads to responses from the player. The combination of information and question by the coach elicits a correct response which is discovered by the player. Guided discovery simply means that the coach raises questions and provides options or choices for the players, guiding the players to answer the questions because they become curious about the answers. The player in a command style setting thinks too much about what they are trying to do, a form of paralysis by analysis. If the coach instead guides the players in a player-centered training environment, then they gradually become capable of holistic thinking in their soccer performance. Holistic thought is opposed to the analytical type of thinking. Analysis means to divide the whole into parts to be studied more closely. Holistic thinking considers the parts as a whole. Soccer performances, training sessions and especially matches are better suited to holistic than analytical treatment because they involve an integrated set of movements that must all happen at the same time. Holistic thinking has been linked anatomically to functions carried out in the right hemisphere of the brain. The right hemisphere coordinates movements and sensations associated with the left side of the body and the left hemisphere does the same for the right side of the body. In addition, the left hemisphere is known to control analytical thinking, which includes verbal expression, reading, writing and mathematical computation. The functions associated with the right side of the brain are those having to do with sensory interpretation, coordination of movement, intuitive or creative thinking and holistic perception of complex patterns. This hemisphere can grasp a number of patterns simultaneously. It is often argued that effective coaching is as much an art as it is a science. Guided discovery in coaching soccer is a balance of the two. In a broad sense, our coaching style of the American soccer player must move away from the sage on the stage and more toward the guide on the side. For players to become self-reliant, the coach must not micromanage the game for them. As a player-centered sport, some coaches become disillusioned as they learn that they are the guide on the side and not the sage on the stage. In many sports the coach makes crucial decisions during the competition. This coach-centered perspective has been handed down to us from other sports and coaching styles of past generations. In soccer, players make tactical decisions during the match; the coach’s decisions are strategic. The ego-centric personality will find coaching soccer troublesome. During the match the coach can call out some general reminders, “mark up” for example, but for the most part should remain quiet, only yelling out loud praises while sitting and quietly observing the match. It is the players who should be heard the most during a match. Some team supporters might think the coach is not coaching if there is not constant talking, so parents will need to be educated on why this chatter diverts players’ attention. Team supporters too often have their view of the match colored by the professional model and by the way coaching is portrayed in other sports and in the sports media. In a coach-centered sport with frequent stoppages in play and timeouts, the coach takes on a direct role during the game. Soccer does not stop except for a serious injury and halftime, giving the coach an indirect role during the match. The coach should attempt to have players play for an extended period of time. The players must solve their own problems on the field instead of having the coach make substitutions in order to solve the problem for them. Coaches should not platoon players in and out of games in order to wear an opponent down. Unlike most team sports, soccer is a player’s game, not a coach’s one. Substitutions allow for all players to play and will speed development for a greater number of players. The coach should decide before the match or tournament what the policy regarding substitutions will be and stick to it. Players have more room to grow when the coach makes sensible substitutions and talks less during matches. In this fertile game environment, some players will grow as team leaders. This will begin with a player directing one or two players, and in time, the entire team. Leaders will guide and inspire the team from within. Body awareness: Activities that emphasize the use of body parts, motion, coordination and balance, with and without the ball. Maze games: Activities in which the player has the opportunity to move in a 360 degree environment, with and without the ball. Even though the area is defined, there is not necessarily a specific target or boundary to go toward. These activities allow the players to make decisions while moving in all directions. Target games: Activities that involve solving the objective by going from point A to B. In contrast to maze games, these activities are more directionally defined and can be done with and without the ball. There will be times in training activities when the concepts of each of the three main types of game-like activities may be utilized in a single activity. Additionally, for the U11/U12 and older age groups, further modifications of an activity can be useful to player development. Conditioned games: Game-like activities with a condition placed on the activity, such as goals scored from crosses count double. At most, only one or two conditions should be placed on any activity. Restricted games: Game-like activities with a restriction placed on the players, such as a maximum of two touches on the ball. At most, only one or two restrictions should be placed on any activity. Friedreich Froebel, German Educational Reformist (1782-1852 A.D.) fostered the idea that learning can occur through play and games. To affect all four of the components of the game, the ball to player ratios should be followed as outlined in the following table. When the ratio is correct for the majority of the time spent in a training session, player development is accelerated. When conducting training, the coach should be mindful of the variables that can be manipulated. The proper balance and control of these variables can make for a good training session that is enjoyed by all. Three overriding factors impact all training sessions and matches: frequency, duration and intensity. Frequency comes back to seasonal planning and the soccer calendar and is the number of matches and training sessions planned and when they occur. Duration is the length of time spent in each training session and match. The length of matches is set with possible variables being in a tournament where the length of the matches might be shortened or, if a winner of a match must be determined, then there may be overtime and possibly penalty kicks. The coach has direct control over the duration of training sessions. The time of a training session may be shortened but do not lengthen it. More is not better. The optimal length of a training session for each age group is provided in Table 7. Once mental and physical fatigue has set in, little more can be learned by the players. The principle of distributed practice discussed in Section 5, Seasonal Planning applies here. The factor of intensity is largely out of control for the coach during a match as each game takes on a life of its own. To a degree, the intensity of a training session can be controlled. Control of training intensity begins with a well written session plan, so each activity put into a session plan should be thoughtfully considered. How exerting is each activity? Do not have more than two vigorous activities in a row. A training session should have a rhythm of low to medium to high and then low in the physical demands. When too many highly strenuous activities take place in a row or one vigorous activity continues for too long (duration), then fatigue takes over. This is when play gets sloppy, poor decisions are made and injuries may occur. Again, more is not better; remember the principle of distributed practice referred to at the end of the prior paragraph. Coaching in the flow – Coach from the sidelines as the training session goes on, without stopping the activity. Individual coaching – One-on-one, pull a player to the side while the activity goes on. Make corrections at a natural stoppage – free kicks, ball going out of bounds, injury, etc. Manipulation of the activity – For example, a four goal game to teach the players how to look both ways, switch the point of attack or shift defensively. Freeze – The least desired way to teach; stopping the session to paint a picture kills the flow of the activity. Determining which of these tools is best suited at a certain time of the training session is the key to making the session enjoyable while still being able to teach and learn. Finally, coaches can manage pressure in training. There are three aspects of pressure that occur in every game and for every age group. They are time, space and opponent. Method of scoring, touch restrictions, etc. A coach should manage the training variables in the flow of training to achieve the desired outcome. Train with an attention to detail. Soccer is a competitive sport. Competitiveness is a natural and desirable mindset, but it can spawn negative consequences if not properly harnessed. It is essential to note that overly competitive trends are not only adversely affecting the essence of player development, but also blur the line between ethical and unethical behavior. The mission of any youth organization revolves around these fundamental goals: develop character, instill values, teach respect for authority and society, develop confidence and a positive self-image and help youth reach their potential in life. The goal is to use soccer as the vehicle to achieve this mission. What role should administrators, referees, coaches and parents play? Together, they have an enormous impact on the lives of millions of youth soccer players in the United States. While each parent must be accountable for individual actions and teach the child to do the same, administrators, referees, coaches and parents form a quadrangle of role models from whom many children learn behaviors that they will carry into adulthood. Cooperation, respect and maturity among the adults in soccer will encourage those qualities in our players. The mission of a soccer club should not revolve around winning championships. Winning is a byproduct of a quality program, but it should not be the driving force. Coaches: What can you do to make the game of soccer more enjoyable for the players? 1. Attend coaching classes to learn the most effective ways to conduct training. 2. Teach skills and fair tactics – discourage unfair gamesmanship. 3. During matches, leave the tactical decisions to the players. 4. Concentrate on coaching, rather than on the accuracy of a referee’s decisions. 5. Take a course on the Laws of the Game and officiate some matches. 6. Remain calm – do not make loud, offensive remarks. 7. Be positive, avoid confrontation with any official and be a role model of fair play. 8. Set high standards for yourself, the players and team supporters. 9. Provide good behavior guidelines to parents. 10. Be firm with parents at matches. 11. Communicate with parents frequently through newsletters, in meetings and at social gatherings. 12. Play the game yourself and encourage parents to play and referee soccer. Create age appropriate conditions and intensity of competition. Cause transfer of learning from training to match. Encourage players to develop physically, technically and tactically. Develop a team framework and teach players their roles so the team has a good soccer environment. Explore a variety of strategic situations and have mental and tactical rehearsal for all eventualities. Develop infrastructural support; the club has a good soccer culture. Develop psychological strength and maturity of the players and team. Ceaselessly study the game and work to improve the craft of coaching. With a player-centered coaching approach, players are given more ownership of their learning, thus increasing their opportunities and strengthening their abilities to retain important skills and principles. This learning also develops the players’ ability to make good decisions during matches, an important element in successful performance at any level of play. It helps players to take a leadership role and ownership in enhancing the team culture. Player-centered coaching places a high priority on the total development of the player. The game within the child is a concept central to the American approach to youth soccer coaching: that the game of soccer is already within each player and the talent of a coach is used to bring out the game from within each player. The approach of the game within the child, pioneered by Dr. Ron Quinn and colleagues, requires coaches to have a solid knowledge of the game. Coaches must understand who is being coached and allow the player to make decisions by using guided discovery in coaching and by setting appropriate soccer challenges for players to improve their problem-solving skills. They won’t care what you know until they know that you care. It is important to develop a coaching philosophy when getting started in coaching. For that matter, even experienced coaches may want to re-evaluate their philosophy. A coach’s philosophy has an impact on daily coaching procedures and strategies. A coach’s philosophy is actually a very practical guide. The beginning coaching philosophy usually comes from our former coaches. This is a natural start because it is the approach with which we are most familiar and comfortable. It is also reasonable to assume that the philosophy of a person’s everyday life, thoughts and actions would be applied when it comes to coaching. How many coaches would stick to principles of Fair Play rather than win the match? There may be a gap between what is thought to be the right thing to do in daily life and the action taken on the field. Coaching is much more than just following a set of principles or having a well-established club. Coaching is interaction in young people’s lives. The players who come onto the field are students, family members and friends to someone. They are the same person in all areas of life with the same personality, ideals, flaws and struggles throughout all aspects. It is the coach’s responsibility to help players make right and more mature decisions in all areas of their lives. Coaches must help them develop character, discipline, self-motivation, self-worth and an excitement for life. To achieve these objectives, the coach must set these standards for the players and others around them, and then help them reach those standards by developing appropriate relationships with them based on respect, caring and character. When character development is the foundation for a program, players will get the most out of their soccer experience. When that happens, the coach will also get the most out of players, for this approach makes champions. The most successful coaches are not necessarily the ones who win the most games. Coaches who have successful experiences focus on team cohesion. The desire to see the players learn and improve their skills is the key to effective coaching. Coaches should commit to using all of their knowledge, abilities and resources to make each player on the team successful. The focus is to promote an atmosphere of teamwork, mutual respect and commitment. By achieving this, the coach will be successful and also win. Proper player development leads to good match performance, which often leads to victory. But there are shortcuts to winning, particularly with players younger than high school age. Just get the biggest, fastest child around, then outrun and outmuscle the opposition. Play run-n-gun attack and high pressure defense against young players who are still learning the game and those tactics can win matches. However, it doesn’t help those children to learn how to play soccer in a sophisticated manner, which is required for future success. US Youth Soccer focuses more on match performance than outcome; yet, this is not to say players should not strive to win. There’s nothing wrong with winning. But remember, the outcome of the game is not necessarily a measure of whether the coach is doing a good job developing players. Players and coaches should diligently work to improve their performance. This is the drive for excellence as opposed to momentary success. So how do we measure success? How do parents know if the coach is doing a good job of coaching the players? How does the novice coach know if the players are growing within the game? Fair play: Does a player demonstrate by words and actions a sense of sportsmanship? Rules of the game: Do the players know and follow the rules of soccer? Health and fitness: Are the players fit enough to meet the physical demands of the game? Are they developing good nutrition and hydration habits befitting an athlete? Friendships: Are the players creating new friends within the team and with players from other teams? Skills: Are the players demonstrating a growing number of ball skills and are they becoming more proficient in those skills? Roles in the team: More important than learning a position, are the players learning about positioning? Knowing where the center forward plays in the team formation is important; yet, learning how to move tactically within the game is far more important. Do all of the players get exposed to playing all of the positions? Leadership: Are players being given the opportunity to take on leadership roles and responsibilities? Are the coaches and team managers teaching leadership? Tactics: Are the players experimenting with new tactics in matches? The coaches must teach new tactics to the players in training sessions, and then allow them to try out the tactics in a match, regardless of how that might affect the outcome. Retention: Do the players come back year after year? Retention is recognized also as a short-term measure of success in youth soccer and developing well-adjusted citizens is another long-term measure of success in youth sports. It takes many years to develop into a quality soccer player. Indeed, that continued development can be seen even in young professional players. Soccer is a long-term development and late specialization sport. Striving to improve individual, group and team performance is more important at the youth level than the score line. Simultaneously, players should play to win. Coaches should teach and develop the players as they learn how to win. Parents should support the players and coaches. Intrinsic success is, by its nature, more difficult to measure than extrinsic success. A trophy is more tangible to an adult than the exhilaration a child feels while playing soccer. The final measure of success for parents and coaches of the player’s soccer experience will require a good deal of patience from the adults. That measurement is the free choice of the child to stay in the game. Nowhere in this Model is there mention of the measurement of ball skills; i.e., the number of juggles a 14 year old should be able to do or the elapsed time for a 9 year old to dribble through a series of cones. Using these measurements in a fun contest format for players can be a positive motivator for youngsters to practice with the ball. However, coaches should not use these measurements to assess player talent or to make player selections. A game is a recreational activity involving one or more players. This can be defined by a goal that the players try to reach, or some set of rules which determine what the players can or cannot do. Children love playing games. They play them primarily for entertainment or enjoyment, but games may also serve an educational role or for stimulation; children learn through play. This fact seems to have been lost on many. It appears to have been replaced with other descriptions such as enemy, battle, war and fight. This sense of combat is not the game of soccer which is a competition. To compete is to seek or strive for the same thing as another. Competition is a trial of skills. The definition of competition is when players strive to attain a common end and may have the friendliest feelings toward each other. The opposing team is made up of fellow competitors. The opposing team, staff and supporters are members of the soccer family. During the match, players must compete to the best of their ability. After the match, they should come together to grow the game in our country. Treat the game and its participants with respect. In some parts of the world, learning to play soccer was ingrained in children through their culture. That culture was permeated by soccer. Young players had many chances to make mistakes, try new tricks and learn the game while playing in neighborhood games. These same children regularly watched professional and international matches in person or on TV. They evolved into the game at a natural pace and moved into their first formal team around age 11 or 12. For generations, those imbued with a love for the beautiful game learned the game from the game. Long before getting a spot on a team with a coach, countless players had their passion for soccer deeply planted in the pick-up games of their childhood. While the pick-up game still exists around the world, a child’s soccer experience is increasingly centered on the formal training session and not the neighborhood game. In the U.S., historically that soccer culture existed in only a small measure and almost exclusively in ethnic enclaves. For the majority of our players, the soccer experience has been a formal one from the start. In that soccer background, too much emphasis in the training of players has been placed on a robotic drill routine that has the coach at the center of training. Instead, the game must be the centerpiece with players at the forefront of the action. Indeed, both US Youth Soccer and U.S. Soccer have advocated a game-like approach to training session activities for over thirty years. The essence of the game is based in the relationships built and the feelings of accomplishment sensed by all who participate in the world’s game. As the world’s game, soccer can take one around the world to experience the sport and other cultures, learn languages and better relate to others. The game in many aspects is a school of life. Soccer evokes emotions affiliated with beginnings, lifelong relatedness, dreams and hopes. Participation in the game can help form one’s life and personality. As caretakers of the game, coaches must have fun and health as the first concern within the competitive and social dimensions of the game. Soccer is the game the world plays; one with a long and colorful history on our shores. A game so easy to understand and easy to play, and yet so hard to perfect, “The Game for All Kids!”. It is a game to play anywhere, anytime, by anyone. For a simple child-like ballgame, soccer has come a long way in the U.S.A., and it shows no signs of retreating. The world’s game is also an American game. Soccer is a game which repays the amount of work an individual puts into it. When coaches put more into their craft of coaching, the players benefit. Any seasoned coach will say that theory is only valuable when it can be put into practice on the field. Therefore, this is a practical manual that will enable a coach to get the best, at any level. Soccer, especially at the grassroots level, is more than a sports activity, more than the promotion of physical skills and the report of scores. Soccer carries a responsibility for society as a whole. The misguided notion that if beginning soccer at age 5 is good then 3 or 4 is a head start. The same flawed logic is often used in beginning tryouts too soon. The misapplied idea to increase training from one hour to two or double the number of matches from 50 to 100. The idea of progressing from tactics to skills, or from why? to how? rather than vice versa. In training present problems of “what to do?” and “when to do it?” and not just “how is it done?” (Thorpe, Bunker, & Almond, 1986). Understanding Competition versus Cooperation in Youth Sports, Angela Reinhart, Unit Educator, Family Life Champaign County Unit. How Psychosocial Sport & Play Programs Help Youth Manage Adversity: A Review of What We Know & What We Should Research by Robert Henley, Ph.D.; Ivo Schweizer, M.A. ; Francesco de Gara, M.A. ; Stefan Vetter, M.D. at the Centre for Disaster and Military Medicine, University of Zurich, Zurich, Switzerland awareness with too many instructions (over coaching) will make the player so pre-occupied that he or she ‘can’t walk and chew gum at the same time’, so to speak. Gamesmanship is when a player tries to fool the referee into making a call on an infraction that did not really happen, such as “diving” in order to get a free kick. Modified Excerpt from US Youth Soccer Player Development Model for more information you can access the full Development Model on the ASC website.